This paper aims to capture and foster current thinking on new and emerging use cases for microgrid energy storage, and in particular the growing need to combine energy and power applications into a single flexible and valuable long-duration storage asset. This market evolution is significant because it increasingly requires storage asset developers and owners to look to new battery technologies beyond the lithium-ion battery chemistries serving the short-duration applications deployed so far. • Cost remains a primary concern but smart storage purchasers are beginning to look beyond capital expense to more effective measures of lifetime cost and flexibility. • What makes long-duration storage (LDS) attractive is its availability to capture a wider range of use cases and potential revenue streams. • Decision makers are aware of a growing need for LDS and want to know more about its potential. The findings in this paper are based on a combination of online questionnaires and in-depth discussions. 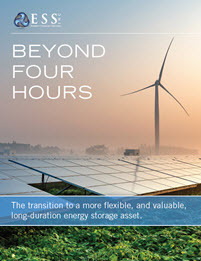 This paper makes the case that all-iron flow batteries can meet the requirements that developers have for a long-duration storage asset that is safe, low-cost, and flexible today and into the future. Historically, energy storage has focused on bulk energy management, with pumped hydro still making up around 90% of all capacity installed worldwide. Recent increases in the level of grid-connected intermittent renewable generation have, however, switched the attention of utilities to the need for seconds-to-minutes energy storage of up to megawatt scale, mostly for power applications. The technology of choice for these short-duration applications is lithium-ion (Li-ion) batteries, which accounted for 99% of all grid-tied storage deployments in the second quarter of 2016, for example. Nobody disputes the suitability of Li-ion for such applications, which in some cases may extend up to two and potentially four hours. However, there is clear evidence of growing market demand for more flexible, mid-to-long-duration applications that Li-ion is not technically and economically suited to.